The following diary entries were written by Ella between December 28, 1913 and July 29, 1914. Note that sometimes she uses K-n-u-t-e with an e at the end, the anglicized version, and sometimes K-n-u-t, the Norwegian version. Either way the K was always pronounced, ka-nute. I have corrected some of the spelling (mostly bringing together compound words like, awhile, or racetrack, and adding some helpful commas) but her English was really good after only a few years in the US. Of course, you will see, she gets good marks in English in school. Knute and I parted last Sunday in the best of spirit. Tuesday he phoned up and said he would be up for sure Christmas Eve. No he did not come nor telephone. Christmas day just the same and I have not heard from him since. He did not even come to the Vikings Saturday night when he said for sure he would come. They are all wondering about it and his reputation is not increased to any better for doing this trick. Really I have been brave and have had just a fine time but oh, I would want to see him today. I think he is treating me most shamefully. Really, I never can understand it why he does not let me hear from him. The thoughts wander back and forth and I have many ideas and not all very good and favorable. If I only knew what was the matter, surely if he was sick and wanted me to come up his sister could have phoned me up and I would be glad to go up when he was not able. But not a word. It is now two o’clock. If he does not call or come up today he had another girl as sure as my name is Ella. If he has, that is well and good but why not say goodbye to me like a gentleman.. Oh, Knute, I really have the heartache! I feel happy today and everything is all right between Knut and I. Yesterday morning Peter took Martha, Chris, Andrew and me out for a long automobile ride, to Pt. Defiance, out to Narrows and coming to Sheridan and Seventh, I went into the house and I was then waiting for Knut to call up which he did not. After a while the rest came home from a ride over the Indian reservation and all over. We had dinner, Lutefisk, and then Johanna & her friend, the girl that stays there and goes to school, also came up. We were just getting ready to go, when the doorbell rang and Knut came up. The rest went out and he and I were all alone. I sat over in a chair by the window and did not say but a few remarks. It seemed like my tongue was tied. He came over and bent over and said: “What’s the matter, Ella.” I said ‘Oh nothing. There’s something on your mind. Now tell me.” “I tell you it is nothing.” And so the phone rang and interrupted. At last I told him that he had promised to come up and had not let hear from him for so long and I was waiting for it. He said he had not intended to hurt my feeling and had not thought over matters and asked me for forgiveness, but I did not say a word. Then he said, “Well if you want me to go I’ll go and if you want me to stay, I’ll stay.” I remained silent and he said goodbye with emphasis and took my hand. Then I could stand it no longer but drew him towards me and tears came to my relief and dropped down on his face and there we were both getting over our sullenness and became happy again. We sat until dark and then I lit the Christmas tree and everything was so cozy. I gave him his present, the handkerchief case with one “S” initialed handkerchief. He thought it was very pretty and asked if I had made it. Of course I had. He gave me the cutest sweetest little crocheted handbag, cream colored and a small pair of scissors, good and sharp. I cooked some lutefisk for supper and afterwards for the first time he helped me dry the dishes. He wanted to go to the show but I suggested we go out for a walk and he go home early and I would come up on the Hill tonight. Well this is all quite a long account but I felt as if I had to write it down, now I am going to wash clothes and hustle up. This is the last day and last hours of 1913, the good year. Andrew and Chris went over to Valhalla and Peter and I are sitting here all by ourselves. Knut is coming up after a while to see the new year in and old year out with me. 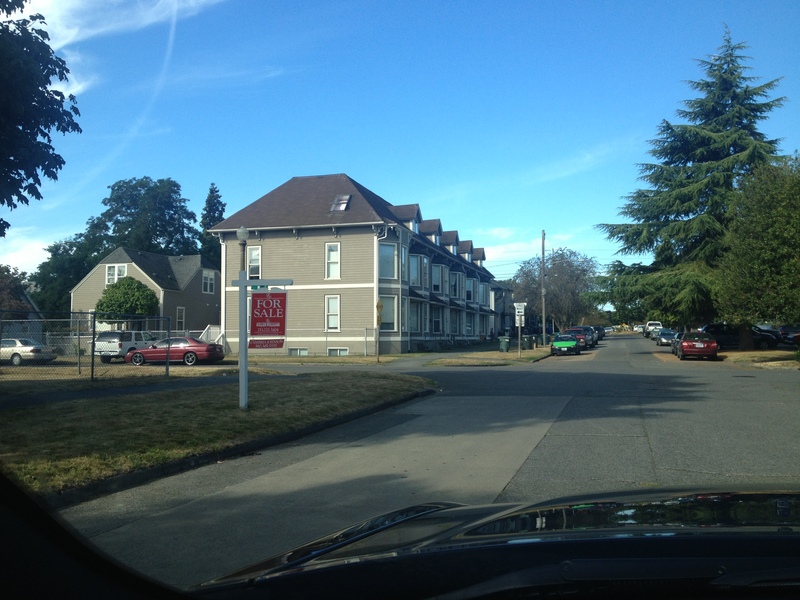 Recent photos of 1316 S. 7th St. The house the Brevick’s lived in at 1316 S. 7th St is no longer there. These two pictures show what is currently at the spot. This is my last Sunday at 1316 So 7th St because we are going to move Wednesday or Thursday. Peter took Mrs. Brandes, Herman and me out to see the new house this morning. It is a lovely house – five rooms but they are going to board in the sleeping porch for me so I’ll have a room too. The first private room I have ever had that will be lots better than sleeping in the front room. There is to be a door from the porch into my room so I don’t have to disturb anybody to get to bed. I am much pleased with the house and so is Peter. I am glad Martha and Louis are to move in too because it is a great deal of work to take care of a five room house and besides very lonesome to have to spend most of the evenings alone as Peter goes out a good deal and I could be all alone. Well I shall tell more about the house and arrangements later. I am not so anxious to move away but am not really sorry either. Of course here I have had the charge of everything and in a way I probably will miss it, but – after all what’s the difference. Some day I hope I’ll have a nice home of my own. Yesterday I had a post card from Sophie Lund my friend and playmate back in Narvik. I have liked school and in 2 weeks I start the 4th and last year of High School. Now I am anxious to finish—do not feel like quitting at all but want my diploma. I feel just like being quite near through which I never did before. I must get to work now I have to study my lessons as Knute is coming up soon and we are going up to his sister’s new place. Peter, Mrs. & Mr. & Master Falk are up to Louis for dinner. I went down to the restaurant with Mrs. Brandes and Herman and had a nice Turkey dinner. 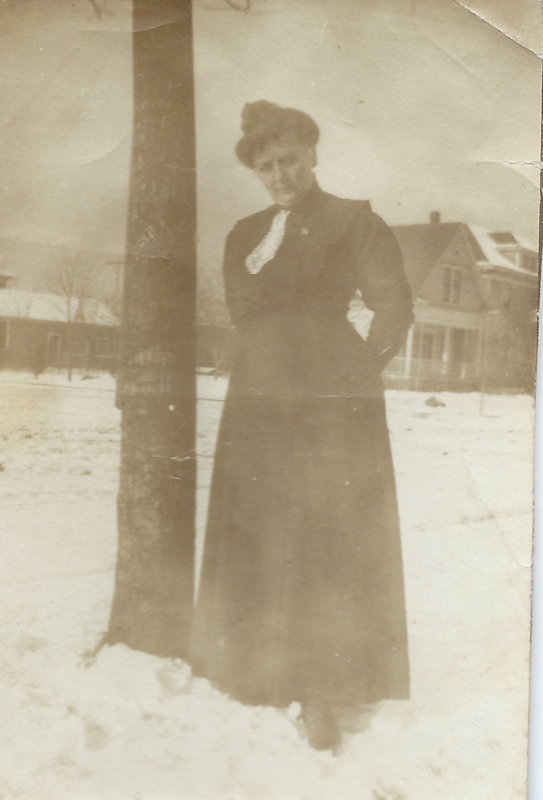 Mrs. Christina Brandes, the Brevick’s landlady on S. 7th St.
My heart aches with the thought of moving away from here and staying so far away from school and everything. Oh my I know the conditions won’t be the same as they have been. Perhaps this is a foolish notion. But still I feel like crying with the thought of leaving here. I have had the best time that I ever could have. Well, I will make the best of it no matter what comes in the way so help me God. Oh my god, I am just so tired and nervous that as a relief I was able to shed a few tears. I have been taking shorthand and typewriting now for two years and I am still very slow in it and it seems awfully hard. Now Chris told me that if I finished high school and went six weeks, took up a teacher’s special course and passed the examination that in one and a half years from now I could be teaching school and drawing a salary of $75 a month and my commercial training would fit in fine and give me that much more. In order to do that I would have to change my program. Knute came up last night. Poor boy had to go to the hospital today for an operation on his other ear. First Sunday at my new home. This morning I got up before it got light and started to build the fire and stirred up some hotcake batter. After breakfast we washed up all the dishes and placed things in order. Things are real cozy about here and I have a nice bedroom all for myself. Then we had dinner and right after, Johanna came with corn and her sister. They had to go soon and I took the next car thereafter down to see Knut. But I came there about 6 o’clock and they would not let me come in before seven o’clock. I went up to 1316 So 7. Mrs. Brandes was out but I had my key and went in the house and upstairs. I could hardly bear the sound of the empty rooms just the clock ticking on the wall. I phoned up Bonnie and she was alone home with the little girl. She asked me to come out there next Sunday, but of course, I don’t know if I can. Then finally I went down to see Knut. Received your letter long time ago, but I have been quite busy as we have moved. You see we live on South 25th St and Grant in a new bungalow. You ought to see it. It is real cute inside, five rooms. I have one room all to myself and then Peter has a bedroom, dining room, front room, kitchen and bathroom. It is two blocks from K St car line. Chris came from Idaho for Christmas and is still staying with us. I wish it wasn’t such horrid weather all the time or we would come out to see you folks but it is such horrid weather that we hate to venture out. Hanna, Falk and Arvid are just all fine and dandy. Louis got married before Christmas and he and his wife now live in that little cottage behind them. They papered and painted – fixed it up real cute. Johanna is still working and feels as good as ever. I start my fourth year in High School today, I am waiting for the bell to ring to pass to our new classes. I like to change classes because I get tired of the same studies all the time. I take English, United States History, Physiology, German and Shorthand. The sun shines now brightly in the window. I wish it would keep up for a few days. Well, Engvarda, tell all your folks hello for me. 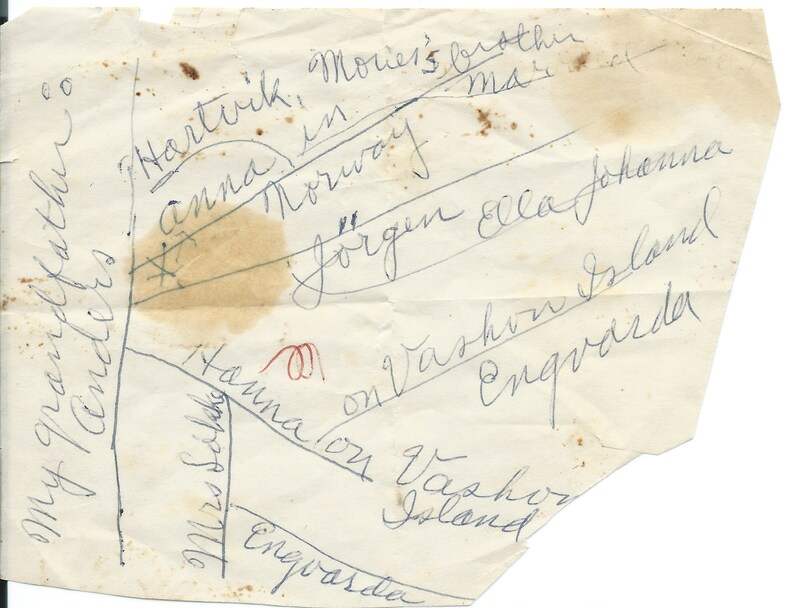 This scrap of paper is written in Ella’s hand and has part of the family tree including her grandfather, Anders, his children, Anna, Jorgen, and Hanna. You will see Engvarda’s name at the bottom. 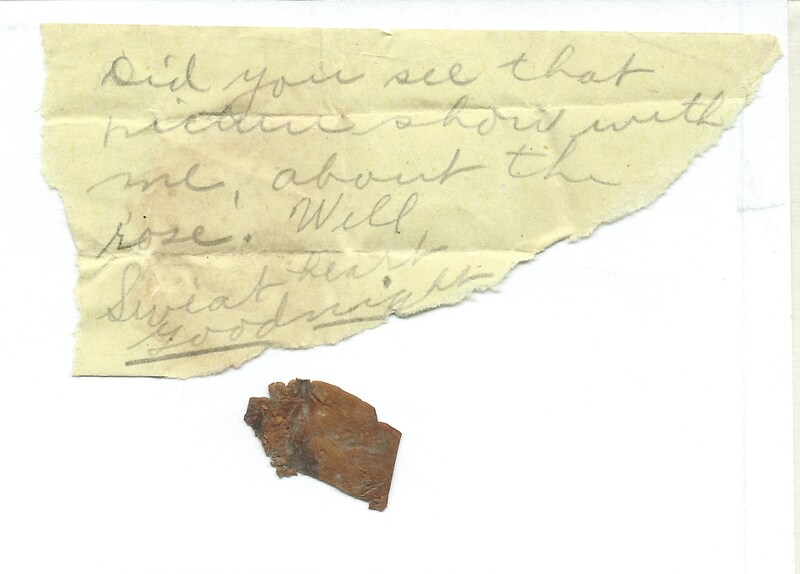 Here starts Ella’s diary covering the dates of January 26, 1914 and July 29, 1914. She began the diary very formally with pen and ink. I have also interspersed text from loose pages by date. Ella Dorothea Brevick born fourth day of October and the year of our Lord 1893 in Hemnesbjerget, Norway. This has been a very happy day, my first day of the fourth year in High School and everything went fine. I went downtown afterwards and walked home, enjoying the healthy, brisk wind. A few moments after I came home, Knute surprised us very much and a second afterwards, Bonnie came. We had a light, real enjoyable afternoon together. They stayed for supper but Chris and I had to leave as we were going to see the “Merchant of Venice” at Tacoma Theatre. The play and the way in which it was acted was marvelously grand. I enjoyed, thoroughly enjoyed, every moment of it so grand in its way. It is very stormy outside and it feels good to sit in a nice comfortable parlor with the heat from the stove radiating. Peter, Chris and Andrew are in bed and it is time for me to retire too. Goodnight. I have not written a word for my diary for a very long time and I have had a great deal to tell about too that have been of importance. However, I will limit today’s writing to one subject – Country School Teacher. Chris made me believe that by a little effort and special study on some subjects, I could pass an examination and take up teaching in a country school. I don’t know whether I am able to do that or not. There are great many obstacles in the way and I am not so sure that I am able to overcome them. I would have to study music, geography, agriculture and a great many other things outside of my high school course. Then there is another question: have I had enough training, have I laid a solid foundation to build up the knowledge that is required of a teacher? I have studied shorthand for two years and I am not capable and do not really care to be a stenographer. 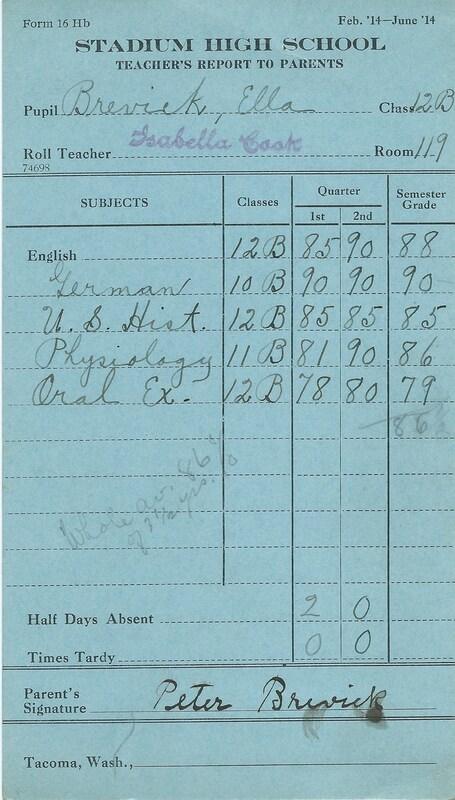 This year I study physiology, U. S. History, German and English, which includes oral expression. I am having some trouble with it. The teacher says the words seem strange in my mouth. Of course really it cannot be expected but I wonder if I am not heading for something which in my position is impossible to reach. It is rather hard for me to grasp and to explain what I have read in either physiology, U. S. History or English because I have not had enough training in using the words, and I am afraid of making blunders, that possibly makes me too cautious. Chris went down to see Mr. Benbow, country school superintendent and he told Chris that I was welcome to see him any Saturday afternoon. I shall take advantage of the opportunity and satisfy myself as to the matter. Why live in uncertainty about anything when information is within your reach? Chris and I went to visit Mrs. Adams tonight. We had just a delightful time. It is something attached to the visiting of that dear soul that leaves something noble and lasting and your character – I feel very grateful then. Indeed, a question, for I know not whether you are my friend, that I have any right to call you “dear.” You seem so cold tonight, thoughtful and queer and I wondered really what was the matter, and Knute, what is the matter? Have I offended you in any way or what is the trouble? But why do I ask such foolish questions when it is and ought to be a plain thing to see that you have found another girl who have the most upper place in your heart and you were merely calling on your old girl. Hah, ha, the last and the best, that is what they all say, and you did too! You always use to say Goodnight, but this time you said, Goodbye so plain that I got the meaning, did that mean Goodbye or not? Well, after all Knute, if your love for me was no stronger and deeper than this, it is better with this “Goodbye” than any later, don’t you think so too. My friend, I don’t blame you, really I don’t I thought that sooner or later you would get tired of such a plain girl as I am. There is an awful struggle within me, the feeling the love and the cool head fight but I must keep my pen steady and write common sense. So this is really the end—well Knute, a thousand times I thank you and the heartiest of thanks for all the good times we have spent together. I have been happy and I hope that you have been and if I am not too much mistaken about your character I think you also were happy, but perhaps it should not be the way we planned, so there we are under the will of fate. I say: Good Luck in whatever you may do. Here is one little leaf of the first rose which I shall always keep!! My god, I can’t endure this. Chris has gone back to Idaho now. Before he left, we had Mrs. Adams and Margaret up for supper one evening. They enjoyed it very much. They are such lovely people. Sluth’s were up here last Friday. One Saturday night a great many of our friends surprised us. We had a fine time, danced, played cards and have a splendid time all around. Peter got a fine silver set, coffee pot with three other pieces. I think our house is just dandy, have had lots of good times here already. Johanna has not been working for a month but today I went out with her to look for work out in So. Tacoma for Mr. Fatland and his daughter who teaches school. Seems to be an all right place. Hannah and her Arvid are just fine. Knute Strand has been recovering after his last operation but now he is to start work again Monday. He has been up here quite steady this week, he wanted to make up for the last week when he was up here only one half hour Monday. I am to go out with him tonight. The interest is as high as ever. School is all right, I study German, US History, shorthand review, English and physiology. Gee whiz. I have been waiting for Strand ever since four o’clock and now it’s seven. I am so sore, sorry and angry. We went to church this morning and on the way home we were invited for dinner and went of course. I came home at 3:45 and I have been waiting for him ever since. We were going down to Tacoma theater and everything and now I have to go alone, makes me sore and I have been alone all afternoon. I have studied, but soon got tired of that, did not have very much to do anyway. If he had been here, he could have left a note or he could have called up later if he wanted to. Strand makes me sore if he is going to play tricks like that. I could have gone somewhere else if I had not depended upon him to come and take me out. But now I better get my wraps on and go to take the next car. Today is Peter’s birthday. He is 29 years old today. Last Monday was Johanna’s birthday and we had a party up here for her. Silberg, Mrs. Brandes, Hannah, Arvid, Louis, Martha, Alea, Strand, Johanna, Andrew, Peter, and Gudrun Skarbo so we were a nice little crowd. Had a fine time, played cards. We had chocolate for refreshments. Johanna says she can’t remember when she did not have chocolate on her birthday. I gave her a book called the “Watcher of the Skies” and she got a collar from Gudrun. Falk has been in the hospital for two weeks, sick with appendicitis. He recovered quite fast after the operation and yesterday forenoon when I was down there, he was sitting home in his rocking chair reading the paper. Hanna is well and so is Arvid. Johanna works out in South Tacoma for a lady and her father, Mr. Fatland. She is a school teacher out there. J likes her place very much, not so much to do, so she has lots of spare time. Only the girl objects to J going out in the evening and of course a young girl doesn’t like to stay in the house all the time. I wrote to Christina last night and at 7:20 I left for Tacoma Theatre to see the great moving picture Seikes, the “Creations of the World,” given free by the London New York Bible Association. It is divided into four parts, giving the most important parts of the Bible. Last night was the Creation, really great. I phoned up Strand tonight, he was sore because I was out. Said when he found nobody home he went down town and walked about doing nothing. I said, “then, why didn’t you phone up I was waiting for you all afternoon.” Well, he had once and again about Eight O’clock. I am glad I went out, guess he did not care so much and for my part the thing the day of loneliness is gone so no more to be said about it. Andrew says he thinks that nothing will come out of this affair and no one knows perhaps not and perhaps yes. Sometimes it occurs to me that it would not take very much to end it both from his and my side. Of course I feel lonesome. I miss him when I don’t see him. Today is a frightful stormy and cold day. The sun shines amid clouds and rain. Strand was here today as he came driving by. We talked about Sunday and the one blamed the other. I must ask myself this question: Do I love him or do I not? Really I don’t know what to answer. Certainly the love is not as great as it used to be, by for not as deep and strong. If I was to marry him tomorrow, I would back out, at least I would postpone the time. I feel as we are growing farther apart, not enough of admiration, I suppose. In some ways, I think he is fine but in other ways I don’t. For instance, his smoking cigarettes is something I never could overcome or get used to, for I hate the sight of them so. In my estimation it lowers a man to see him smoke those dirty things, so cheap and really harmful. Perhaps I ought not write this against the man that I have gone with for nearly a year but somehow I have a feeling that it will not be long before something turns up that breaks it up completely. It might be hard at first but still I will forget him in time just like I did that other one. I missed him at first but time remedied the wound. Who knows but perhaps someday I shall meet someone who captures my heart, my admiration and keeps it—and yet—who knows, I might die an old maid with only memories of sweethearts and love. Still these thoughts should not dwell within my soul, let them go. It might be that my heart is small and has not even room for love. Shorthand. Somehow I am longing for a change, longing for something perhaps unreal, just found in dreams. Oh world, when shall I ever learn to know thy many ways? I sometimes read over what I have written before and such a difference, really now it does not seem genuine. I wonder if I ever will like him as much as I once did—a sort of sadness creeps into my heart. And so selfish, is that the cause of it all, answer not to be found. But what is the use of meditating about anything. Let come what will and face it bravely. Shorthand. I said nothing and then was a most awkward silence for the longest time. He took me on his knee and we sat then and talked more freely about the situation I asked him: “Do you really love me?” He said “I certainly do and hope I always shall. Don’t you love me?” “I really don’t know, I don’t know myself,” I answered. He seemed to take it to heart and before he left he asked me to think of him and if possible for me to love him. Thus we parted as friends and God knows whether we ever are going to come into the same relation again. I have been happy with him and thought I would be. Good night. This morning was fine but now it rains again just fearful. I told Andrew about it this morning and he did not say much one way or the other. I sort of regret but then I suppose I have to endure the needles and stings just like he has to. I am going to see Johanna now and hear what she says about it. How things change. I told Johanna about it and she said I ought to make up with him again. Well, I didn’t know what to say, I felt pretty sure this was the end. About a quarter past seven, phone rang and that was Knute and he asked how would it be if I felt different today, “if it would be all right again. Queer how weak a person can be, now I had planned to say: “I think we better let it be as planned last night. But somehow I could not say that so I said: “Sure I feel different about it.” He wanted to come up if only to a little while, he would leave at 10. I let him do that. I phoned up Johanna and she came up here and we had a very nice time here. At 10 o’clock they were going to get the car but missed that one, so they got the 20 after. Of course, I could not resist his love. I know now that he is not merely going for habit but that he really cares for me. This morning when I looked out the window, the ground was covered with snow and it was cold like winter. After a little the sun came up and now the snow is gone and the air feels warm. Andrew is out working, fixing up the lawn. I have been ironing and mending some cloth. Strand came up about dinner time and had lunch with us. He feels fine and looks happy. Tomorrow I think that I go out to Gig Harbor. We had a fine time too in Gig Harbor, Johanna Andrew and I. Martha is in today–her mother is at hospital for an operation. Today I am back to school after one week’s vacation. The weather is fine today but last Monday the ground was covered with snow when I peaked out the window, but of course had to make the best of it. Joh, Andrew and I went out to Gig Harbor Wednesday afternoon and then the sun shone and the air was warm. Had an enjoyable boat ride and a good time over there. Visited all our friends and chased about the country. We came back Friday and went out to Peterson in the afternoon and visited Sluth in the evening. She is getting ready to leave for Europe the 8th of April. This morning the weather was beautiful, sun shining in through the windows. We got up, boiled our Easter eggs—Peter, Johanna and I walked down to the church on 17th St & J. Mr. Ordal is fine minister and such wonderful choir as they have down there. Beautiful music. I just enjoyed greatly. Hanna, Falk, Hildur, Arvid, Louis and lots of other people were there. The church was crowded. I have not seen such a crowd in a Norwegian church since I came. O. spoke in Norwegian and I certainly like to hear a good Norwegian sermon. We came home and here was Andrew entertaining Martha and Mrs. Alvestad from Gig Harbor with her children and Charley. They were in to see Mrs. Nyhamoner. We got dinner ready as soon as possible and they went right after. Strand came up. We were going out but just then it started to pour down, so we thought we would entertain ourselves with singing. While we were sitting thus, Peter came home and for a long time we sang song after song or rather hymns in the Norwegian Hymn book. We had supper and Peter went out. Strand left 10:20 and now I am going to bed. J. is still out and I am all alone. So this is my fifth Easterday in Tacoma and it has been a happy one. I have felt the holiday spirit. Another week of school has passed. I do not look upon this year’s vacation with the same ardour and delight as I have in all previous years, but with a kind of melancholy sadness. I know this will be my last vacation in my school life and with mixed hopes and fears I look forward to the future and wonder what it will bring. I cannot realize that my four years of High School work are drawing to a close; I who never expected to go but a year or two. The time has gone too fast and I do not feel as I have gotten enough out of it to satisfy my expectations in acquiring an education. One study after another comes and goes and with sorrow I confess that I do not get all that I might have gotten out of it. It might be due to lack of intellect, but it seems to me that the more I study, the more I get acquainted with men through hearing their lectures and in other ways come into contact with learned men, the less I know, the more insignificant and minute I am in this great and glorious universe, so full of beautiful things. The time is not long enough hardly for me to get my lessons prepared each day, even if I would study all the time it seems like. With additional duties, household and social I am kept busy day after day without accomplishing much of anything and it appears without gaining a great deal of knowledge either. There are so many things which I feel I lack, so many wonderful things and interesting things which I could learn by study and observation. For instance about authors and books I have read so few books in English and by English authors. Hardly any outside of my high school requirements. Whenever I read a good book I feel its wonderful help, its aid in supplying ideas, its teachings, the influence of a good author’s language upon writing and speech–and still I don’t hardly read two books outside of school books in a whole year. At present I am reading “the Rise of Silas Lapham,” by William D. Howells. The longing for writing books has always been within me and when I read a good book, the old desire is awakened again. But my lack of experience and knowledge of human character, of description and imagination –all these things stare me in the face and tell me “you are unfitted Ella as yet, but there is a ray of hope.” So there I am, the word hope is going to stimulate me to work and training – and perhaps some day I might be able to do something, I fully realize the help a person receives through reading. The style, words and expression is acquired. Description, well really all technical points are learned. I would like to study about foreign countries and their people; that would broaden my mind in many directions. Thursday we had an assembly down to school and Bishop Kaetor lectured or rather spoke to us on the benefits derived from education, and he emphasized the point that it was not what you got into you but what education drew out of you what counted in real life; your future, your possibilities lay in that fact. Before him, a few weeks ago, a young college man spoke of our great opportunity and that we ought to take advantage of it and bend every effort to train our minds to do the right thing every day as it counted in after life. Our youthful habits would be ours and extremely hard to change whether bad or good. Johanna got a place last Tuesday to work for Mrs. Long, who has a summer resort at Steilacoom Lake. She was up last night and night before. We went together to a picture show on K St. and we saw “Uncle Tom’s cabin” played. It was very good and to my mind much better than what I saw staged two years ago. This afternoon Strand came by and of course came in to see his girl. He is fine, dear chap, I like him better than ever. I think he is a nice considerate boy. He is sitting home tonight as I told him I was going to read a book. Really it seems good to have sometime for myself to read and write just what I please. Well now I am very tired. Godnot. I have now written six and a half pages, pretty good I think. Hanna, Arvid and Falk are all well. Falk got over his operation very well and he’s been working now for several weeks. Hildur Theting had her vacation last week and spent it with Falks. She was up here occasionally and the boys took her out. Johanna and I gave a little party one afternoon for married woman with the exception of two, Hildur and Miss Meley. The ladies played cards and were served with coffee and cakes and oranges. All were satisfied, so our bachelor girl party turned out fine. Now I really insist on going to bed, it is twenty to eleven. May day already. The time is flying on hybernian wings. I had the chance to hear a very remarkable man yesterday, Dan Crawford, a missionary from the interior of Africa. He spoke down to High School and in the evening K and I went to hear him at the Christian Church on 6 and K St. He also showed pictures—colored pictures—to illustrate his talk. It was very interesting and educational. This week in school has gone fine. Mrs. Wettleton told me that I was improving steadily in oral expression and I am glad of it. It really seems as it I am improving in everything. I can read and get the substance of my history lesson with comparative ease. Shorthand also seems to be getting easier. I hope that I continue going forward and getting better. Mrs. Aleott said to me after I had given my book report on the Rise of Silas Lapham: You did very well, Ella. That is a long and hard book to report on.” She had no criticism on my English and pretty near everybody else had some mistakes which she corrected. But I will not brag, because I wrote it out first and then practiced it. Of course I did not learn it by heart buy that helped me to collect my thoughts. We have had a beautiful day. Strand, Mr. Berg, a nice young man who Strand made an acquainted with today, and I went out to Steilacoom Lake to see Johanna. We got a boat and were out rowing. Camped on a nice level place and ate our picnic sanguages (sic). We picked violets and stars and amused ourselves fine. Jo and I rowed all the way back. I hope we can go again because it was so nice. When we came back the moon was shining so brightly. Johanna liked the boy; I thought too he was very nice. Now it is ten minutes to eleven and I am leaning over my bed, writing this. This is my first picnic this year. Saturday I received one letter from Olga Stigen a chum and playmate I had in Narvik, and one from Sophie Lund. I was so glad to receive them. Chris wrote us all cards last week saying that all preparations were made for his wedding the next day, May 6. He was so happy I wrote him today. Strand and I went to the ball game yesterday. Tacoma 3 to Spokane nothing. I went to church on 17 and J in morning and Strand and I went to St. Leo Catholic at night. Enjoyed it very much. He just phoned up and I was glad because Peter and Andrew did not come home and I was lonesome. They haven’t come yet but now I am ready for bed. Goodnight. Last night Knute and I went to see that class play down to Stadium High School “As You Like It” by W. Shakespeare. It was acted very well. Strand said so too and he was a bit surprised to see what a nice auditorium we have down there. Today is Saturday and I did a big washing, cleaned the house and now I am so tired and ready for bed. Peter, Andrew and Johanna went to a dance and I would have gone too, I had the ticket from Strand, but I felt bad and tired and so here I am home. Strand was to come up to the hall and take me home but I guess he will be disappointed tonight. Peter got his car ready now. My, it is fine a brand new car body just the engine that’s old. It looks splendid. Tomorrow is the 17th of May. Our National Holiday and the vi Normand skal ha tog, Hurrah for 17 Mai. Everything seems to have been successful this week in school. I have had my lessons quite well and seemed to feel that I am making a progress and advancing in my studies. My mind seems to be made up now in regard to me being a stenographer and bookkeeper after I quit school next January. I am just as glad and hope that I will be well fitted for a good job as that I can earn some money next winter. We made up our programs for next term and although I only had to choose three subjects, I took five because I will need them after I am out of school. I selected, Commercial English, 12a, English and Oral Expression, Civics, Bookkeeping and Physiology. We have only three weeks of school left. Last year on this same date Christina, Peter, Louis, Johanna and I were out on Fox Island visiting Scarbo’s. The day was grand, warm and the sun shone brightly. I remember we had an excellent time and the fun was increased and the spirit heightened by the arrival of a boat owned by one of the Vikings. The crowd of men were out for pleasure and landed on Fox Island in order to see Scarbo who had been sick for several weeks. We girls all went aboard, joked and jollied with the men. I remember my first impression of a young, rather nice looking man in navy blue suit and gray hat. He did not seem to care to take part in the dancing which we girls amused ourselves with out on the lawn, while Scarbo played on the violin, but was rather a silent spectator. The rest were all older men. Later we all went aboard the vessel and I was most of the time busy talking to a comical Dane, while Johanna was talking to this young man and his friend. Before leaving the Dane had given us three tickets for a concert to be given the following Wednesday by Miss Orner and Normandines Singing Society. I then went over to where Johanna was standing and talked a few words with the two men and her. The next Wednesday I met him at the concert and this boy is Knut Strand. Just a year ago today and it seems as if I had known him for several years. I have never told much about him nor what I thought of him myself so therefore I shall write and tell what I think of him. My regard for him has grown higher and higher since one time we had a kind of misunderstanding. He is a good and industrious boy who does the best he can and is not afraid of work. He is also kind and sociable to other people as I can see from being with him on different occasions. Last Sunday I felt so proud of calling him my sweetheart, such admiration as I had hardly felt before. His love for me is true and sincere and he treats me with courtesy and tenderness of nature which appeals to me. I feel sure that we shall be happy together and progress in every way. Saturday night I attended the Nordlandslazel’s Bazaar and I was figuring on going home with Louis when I saw Strand out in the hall. My heart almost thrilled with joy over the unexpected occurrence and we had a fine time together for the rest of the evening. I asked him up for dinner Sunday and Johanna also came. Peter was down in Lacey but came home about six. Well Strand came about half past two in a nice new brown suit, quite dark. He looked real handsome. We stayed in the house as it was raining and I read my long theme on “Oregon” to them. They all thought it was good and he said, “You are some writer, you are, Ella. You will become an author some day.” Well, I wish I could but judging from my slow progress, if any, I am afraid that I never will be able to. We had a jolly time together. Joh and I danced together and tried to learn some new methods and steps. After a while Peter took us out for an automobile ride. Andrew and Strand went to see a sick “Viking” while I waited outside. Peter and Johanna went up to McKinley Hill. Strand and I walked up to the hospital where he paid some down on his bill. He has been making regular payments and I admire him for trying to get rid of his debts. It was pretty hard for him to have to pay for two operations but he is getting at it systematically and does not complain either. We walked through the pretty Wright’s Park down town; we listened a while to a very good blind musician who played on 11th St. on a kind of violin with a horn attached. It made quite an impression on me for I love to hear good music. Then we went to Pantages where they had a good show. He is not close with his money and not extravagant either but a happy medium. Buy maybe this is too much writing about all these trifles. 8:30—We have had supper now and I am just ready to retire. Now the telephone rings. I hear Andrew calling me now and I can almost guess who it is. The dear boy had to talk with his girl and I had been waiting for him too. He will be up here Wednesday night. Well now one year has passed and it has been a very happy year for me and I think for him also. I pray to God that we may have many happy years together in the future. Goodnight. Oh how tired I was this evening from studying in the library but after walking home and having my supper, I felt refreshed. After supper I took a little walk out as I was expecting Knut to come up. This is his night in the middle of the week, and he did not see me yesterday afternoon, as he used to, while driving by here. Certainly he came on that car and we took a little walk up the street. When we came in again Peter had gone to bed and Andrew had gone out. We sat down and ate some cherries that he had brought. They tasted fine too, I have only had two cherries before this year. Knut finally said that “it is too bad to be so poor.” I agreed with him that some money would not hurt. I saw him half way over to the car line and waited there until I saw him board the car and disappear. But now I must go to bed. Goodnight darling. This morning we had an assembly and being the day before Memorial Day we had soldiers there speaking to us. One of them, Com. Wright, I think, gave us a very impressive speech on the battle of Gettysburg. It was simply wonderful to hear it from a man who had seen it himself and survived. He told about Hancock, Meade, Lee, Sickles and others. At last he said that whatever we do, agitate for peace, work for that. Do not let our desire for glory or honor lead us into bloody strife, because nothing can pay for the dead and wounded on the fields of slaughter. Dreadful, horrible sight the evenings when the stars were shining on the thousands of dead bodies, some still moaning. The battle occurred on the 1st, 2nd and 3rd day of July, 1863. The other soldier sang a war song and then we had some nice music from our own forces. The periods were short and we got out at 1:20 to go down to Stadium as it is Stadium Day today. The school children from all over the city were assembled and together with their parents and friends filled the whole Stadium. They had flag and waun (sic) drills. Gymnasium girls danced and the boys did some stunts. It really was very good. I asked Carmen and Arlie home with me as Peter and Andrew are down in Lacy. We met Mrs. Curren and she let Carmen go. Then we went to Arlie’s house and waited until she came home. We picked two lovely bouquets of flowers of red roses and Carmen and I got one each. The weather is just lovely today and we had a nice walk home. For supper we had fried halibut, potatoes, asparagus and strawberries. We had a very enjoyable evening and I saw the girls home, after which I had to take the car and go back to my own home all alone. But now I don’t care, I am not afraid. But now I am going to turn out the light Good night. 11 o’clock. Such a beautiful day. So warm and nice. I am sitting by the window and the sun sends its beautiful rays through. Peter and Andrew are still away and I am alone this morning too, but I feel fine and happy. Yesterday was Memorial Day and the soldiers marched through the street at the bugle call. There were also exercises in the Stadium and speeches. A dreadful accident happened Friday morning in the St Lawrence River. The Str. Storstad, a collier, hit the Empress of Ireland on the front side and ripped it open. 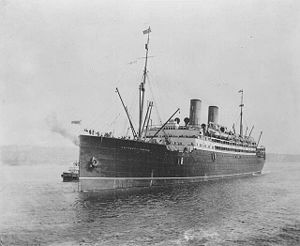 In nineteen minutes, the Empress of Ireland sank with 964 of its passengers and crew. About 300 were saved. 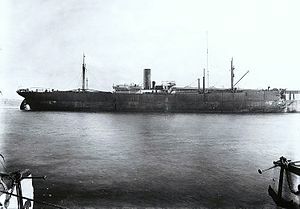 Storstad, a Danish* collier with a coal load from England, after the awful collision picked up and rescued nearly all of its victims that were saved. The sunk ship must either be taken up or dynamited or it will form a sand bar. Empress of Ireland was going to Quebec. That such awful accidents should happen is horrible. So many homes without fathers and mothers. Something like Titanic disaster, only this happened all at once instead of the drawn out harrowing tales that lasted for a week or more. Strand was up yesterday and Louis came up just as we were having supper so he joined the party. Johanna and I are going to see Miss Bergem today. Johanna was coming up here last night but I think she did not get in the house or something for we went to a show and she was not here when I came back. I am going down to Hanna and see if she is there. EB. *The Storstad (left) was a Norwegian collier. (A collier carries coal.) The Empress of Ireland (right) was a passenger liner. Per Wikipedia, 1,012 people were lost. Photos above from Wikipedia. This week has been quite eventful and interesting. Johanna stayed with me until Wednesday when she had to go home. We had a nice time up to Selma Bergem. Monday Johanna and I decided to go up to see Mrs. Brandes and as luck would have it, Strand happened to come just before we left. We three went up to 726 So. 59th. Mrs. Brandes and Herman have the loveliest house. Four rooms downstairs and three bedrooms upstairs. 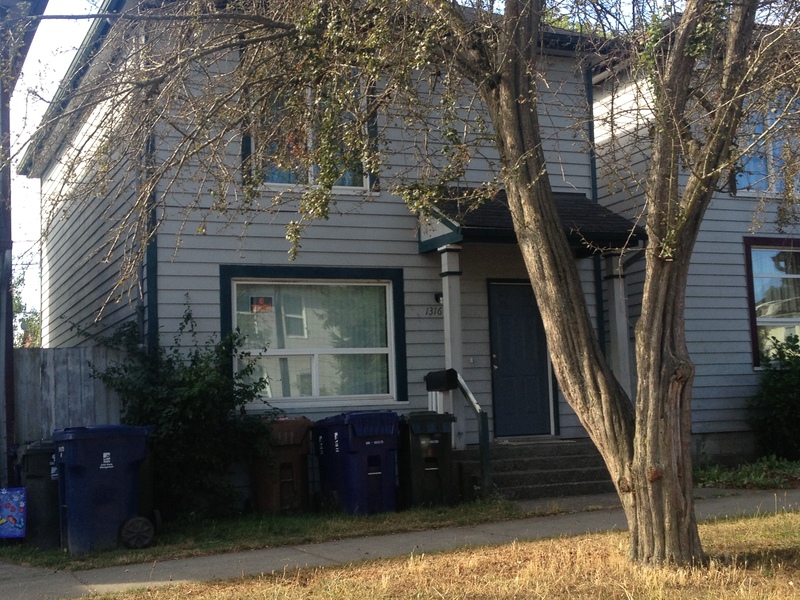 Herman likes it so well out there, he says that the boys are more willing to play than up on Seventh St. 1316 S. 7th. Tuesday I got my history theme back marked “Very Good,” and I had to read it. I like Mr. Rogers. One of the best teachers I have had. Wednesday Johanna left and a few minutes afterwards Clara Johnson came with four lovely big pink roses and a special request to come to the picnic Friday afternoon and evening. Then one of the neighbors, Mrs. Larson, brought a big bouquet of roses. Louis came and then they all went out, but me. I went over to the car and met Strand. We spent a very enjoyable evening together. Thursday I had to look up some history references down in the library. Today I was authoritative on “Initiative.” Strand came up for supper and he and Andrew went down to “Vikings.” I went with them and continued on my way to Library. Friday, today, we had the Senior Assembly, which was very good. It was not sad or melancholy like last year but was quite humorous with recitals from several members of the Class of 1914. After school we got the largest issue of the Tahoma ever published. It contained pictures of all classes, organizations, and activities of the school, 174 pages. We were to go on a picnic out in Pt. Defiance but it rains heavily and I don’t think there will be anything going on. Next Sunday we are all going on Vikings picnic out to Fox Island. Only one more week of School. Today marks the half-decade or five years that I have been in Tacoma or a few days more than five years since I arrived in the United States. The weather today is very much the same as it was then, sunshine and warmth is seen and felt. Our school days are drawing to an end. Thursday and Friday we will go only a half day and Friday we get our cards. I have been working quite steadily and I expect a pretty good card this semester. Just for fun I will put down what I estimate my work is worth: U.S. History 90, Physiology 90, German 90, English 85, and Oral Expression 86. Now I like to see how near these come to the actual figures. Andrew is making a sign for Nordlandslaget’s Grand Ball held June 13. Last night Louis and I were also making signs and Peter put them up this morning so that the affair will be advertised. Strand is coming up this evening and I think we will go to a show. Now I have to get supper. Now I am home. School is out for this year. My card is pretty near what I thought it to be except I got 90 in English instead of U.S. History. English 90, German 90, U.S. History 85, Physiology 90, Oral Ex. 80, average for term 85½. That is 2¼ points higher than last year. I just figured up my average so far and it is 86.32 for the whole time I have been down there. I am pleased with this year’s mark especially in English because that is a high mark for 12B work and only a few get it. Carmen’s marks were very nearly the same as mine but Arlie got lots higher than us. Here’s the report card to prove it! BTW, the next report card is from Lincoln Park High School for Sept. ’14 — Jan ’15. I went to Hanna and with her, downtown. I bought pretty goods–light blue for a dress. Johanna is going to start a new place tomorrow. Louis got a baby girl yesterday at 12:05 a.m. weighed eight pounds. Johanna and I were down there to see her today. Both mother and child are in good condition. Shorthand. I am not quite happy now and I have been sort of unhappy for the last two weeks. The world does not seem as beautiful to me as it did. But with God’s help I hope that I get over it and look on the people with the same ardor and admiration as I always did. This morning I got through with my housework early and started to finish Johanna’s dress. I cannot do very much more before I go downtown and get some material for trimming. I practiced oral expression this morning and now I know Sandolphin by Longfellow quite well. I just love that piece. Just back from a delightful visit out on Vashon. Andrew and I went out there Saturday night. He went home Sunday but I stayed till today and Anna came back with me. She is trying to get a job for a couple of months and earn some money so she can start in High School in the fall. I for my part have plans about taking teachers exams and see if I can’t get a job next fall after I graduate. Well I will see how things turn out in that line. Goodnight. Tonight is crazy night downtown. We just came home from a funny round up. Saw the fire works in Stadium. Montamaro fests great as ever. July 4 tomorrow going out to races with Strand. Johanna, Anna, Andrew, Peter, E. Gustafson boy and another girl were in the car tonight so it was heavily loaded. Goodnight. Hurrah for the 4th of July. It is now half past eleven and I am just ready and dressed up in my pretty new blue dress and new black Mary Janes. Andrew and Anna went down to the dock to meet Abraham. I am waiting for Knut to come up and I guess he will soon be here. This afternoon he and I are going out to the racecourse and see the races. I am so excited about it. This morning it was cloudy but now the sun is beginning to shine and I hope it will be real nice today. I am having a fine time now. This morning Hanna phoned up and asked me to go out to Pt. Defiance with Abe and Anna because she was so anxious to go. Of course I was willing and we three went out there and looked at the animals and flowers. Anna and Abe are going to take the 3:30 boat home and I am going to take the 4 o’clock boat for Gig Harbor. Oh, I am so anxious to get out there and see Martha, pick cherries up to Watson and also wild black berries. The 4th we had a splendid time. Strand came up and we took the train out to the races and it was very enjoyable. Cooper in number 8 Stutz won first prize, $2,500. He won first prize last year too. Afterwards we went down to the Stadium and saw the fire works. Splendid sight. Yesterday I went out to Pt. Defiance with Strand and had a real nice time. Peter took the others out for an auto drive. I wrote four letters, Chris, Christina, Aunt Anne and Sophie Lund. But now I must go. Yesterday I came home from Gig Harbor after spending three days with Andrew. Most of the time I was out in the woods, either picking black berries or sitting in the shade of small alders. Andrew was slashing down alders and shrubbery close by. But the sun was very hot and he could not stand to work so hard and long. One day he got quite a severe headache from it and quit at 4 o’clock. I went up to Watson one day and I enjoyed very much to sit up in the tree and pick cherries. Ate all I could and then I picked a paper bag full. While I was up there a lady came by carrying a lard pail. She asked me the way to Mr. Watson and I went down and showed her through the gates. I thought surely that she was a German lady but afterwards when I came into the house I understood that she was English. She talked a good deal and she told me she had come from Gloucestershire. Her name was Mrs. Latham. Washdal is as well as ever. We were over one night and he and Andrew were discussing some subject. Pretty soon Mr. Anderson, a young man, came over and joined in. I also went to visit Martha and Robert Alvestad as I was going down to the wharf. They were married on the 27 of May. Robert had found a picture of Strand and me. The one which we took last 4 of July, down on Pacific Ave. A little ways from Tivoly Bar. It seems so funny that anybody should pick up the picture and especially anyone who knew us. On the boat Mr. Anderson came and talked to me and we had quite a nice chat about races and tests until we came to Tacoma. When I came up to the house I found a post card from Mrs. Sluth in Norway. She was having a very enjoyable time there. Something unexpected, a letter from Aasta, my old chum. She told about lots of things from back there. I don’t know in one way I think I would like to go back and yet I love this country so much and have made it my home. I telephoned to Johanna and the dear girl was home and said she would be over here in the afternoon. She came about 4 o’clock and sat down and wrote some letters. We were wondering where we should go and finally decided to visit Marie Laurens. While we were getting ready Peter came home. So nice to see him back. He had his supper, fixed his auto and we three went up there and spent a most enjoyable evening. They certainly are jolly people. Olaf, Martin, Clara Serby, Hovland and Marie were home. We had refreshments consisting of ice cream and cake. Played a while on the phonograph and at last the old folks, Mr. and Mrs. Martin came home. We went at 11 o’clock. Today I have been ironing and now I am sitting in the nice front room with door and window open. Andrew and Strand coming along the sidewalk. Andrew came toward the house but Strand went down the street. We were told of a big fire out in the south end and all people rushed out of their houses to look at it. It was a plaining mill and a lumber mill in Bismarck that burned down. The flames leaped up very high and the whole sky seemed to be ablaze. We had a very jolly time with the girls and I received an invitation to come to visit Miss Marlett in Seattle. Andrew took the girls home and I was again alone with Strand. We sat out on the porch for a long time and looked at the fire. I was thinking hard how I could approach the subject of departure and while I was planning tears came and rolled down my cheeks. I tried to keep them back. He said, “That’s a hard place to sit, do you want to sit in a chair?” When I said no, he said, “Do you want to sit in my lap?” No answer but after a little I did and tears started to fall again. “What are you sobbing for? Please tell me. Please tell me, that will relieve you.” “I am just unhappy.” “Well now I want to tell you, without giving you any hint as you usually think that I want to get rid of you because that is not the case, that if you are not happy with me you better find someone else whom you will be happy with.” That is just the trouble he is so good and reasonable that when it comes to the point I cannot stand to break with him. My heart just melts to tenderness again and all is the same as before. Olga Stigen wrote me a letter. She is feeling fine and seemed content. This morning I fixed up in my closet and washed some clothes. I have also written two letters. Yesterday I went down to visit Hanna and Martha. I had a very nice time there and when I came home Peter and Strand were sitting in the parlor. We had supper and Peter went out. Then Strand and I sprinkled the lawn which is growing very nicely in this fine weather. And hour later. Thank God! For giving me power to overcome my selfishness and my craving for money and easy life. To see Knute cry last night like a child when I told him we better part and go each our way has made me think and think hard. Why cannot I, with my good education, help him along so that he will be better fitted for a position that will bring us a good comfortable living. He is still young, he could learn to write better because he writes a very poor hand and he could learn to spell and write some English. In his life, he is handicapped. A man who can speak English and knows how to write can get good positions when they are bright and have business ability. But Knute never had a chance. He never had anyone to help him along like I have and then I should be so selfish and turn him away and not try to help him. My God, that would be wrong, a sin that I would never forgive myself. As soon as he comes up, I shall tell him my plans and then encourage him the best I can. Poor, unhappy boy, I feel so sorry for him. Johanna and I went down town and took in a moving picture show. We walked up Ninth Street and when I came on K the car came so I did not have to wait at all. Peter just came home now. Must ‘phone Knut up tomorrow morning and hear if he is all right. I am so worried about him and feel so lonesome, awfully lonesome for him. Goodnight darling boy. Are you interested in increasing your earning ability, or adding a few dollars more to your weekly pay check? If so, I have a plan which will take no money but will require a strong will and a few evenings of your spare time. I am particularly interested in you and believe that you have ability and business knowledge. But one thing you lack and that is education. Without the ability to write a good legible hand, you are handicapped. Writing is not an art which a person is born with, it is something which is acquired through practice. A few hours of good practice a week would soon improve your writing to such a degree that it would give you a great deal of pleasure. The second factor in your development is a fair knowledge of English spelling and composition. This may seem hard to you at first and you probably think you cannot learn to write an English business letter. But nothing is impossible for the one who has intelligence, youth and enthusiasm. A man at your age should do all he possibly could to better his position. It is absolutely necessary for moral as well as financial reasons, for the one who does not improve, very easily goes back. You may say it is too late, I should have had education while I was young. It is never too late at your age. Many a man has studied and improved his knowledge along different lines after he had reached the age of 25, yes, even 30 and 35. Therefore do not lose courage, make a start at the bottom and climb up the ladder of success. Will it pay? That is another question, Yes indeed. Opportunity knocks on everybody’s door and it is only to be ready, for it does not wait for anybody. You must kindly excuse my lack of information regarding the duties of clerks and solicitors working for firms who pay good salaries, but I think that they have to do some writing to inform their employer of the various business transactions. In our times when education can be acquired free and during the leisure hours of the workingman, there is hardly any excuse. I would therefore suggest that when night school opens in the fall, you would start right in and work hard and in earnest so that you could learn as much as possible. Once you have a start and get interested, you will find that it becomes easier. Concerning penmanship and spelling, you could begin that this summer so that by the time school opened you would have an excellent start. It would afford me a great pleasure and delight if you would look at the matter as I do, and I should be only too glad to assist you in every way possible. I am positive that if you put your sole effort and enthusiasm into this work, by the end of two years you will be capable of holding a good position. Thursday was Grocer’s picnic but Knut did not go as he really did not care and besides he worked half of the day. At 12 o’clock he came up here and we went out to Pt. Defiance Park. We were going to row but as it was rather rough on the water, I decided that we better not. Then we walked up through the Park and we sat down on a seat made of a log on a rather secluded road. Only a few people passed by and we had a real enjoyable time there. I had taken my work along, as little doilie and I finished it out there. Knut had to go down to the Vikings where he was to be initiated as Vice President or “Underhovding”, next highest position. Today I received a letter from Olas and Christina. Both well. Now I have to finally made up my mind what I want o do and what I think I am best fitted for. I am now going to work and specialize in bookkeeping. Nothing could prevent me from becoming a good bookkeeper when I study and learn the details. I am getting along fine with Hanna’s wedding present. Can get it ready now in two days. Besides I have a few things started for myself. This is the last page of this book. I hope the other book will have things worthwhile writing in them. I will finish high school, do my best as a bookkeeper and stenographer. Then —- but here comes something from the inner most part of my soul, my secret love for writing. Oh I can’t hardly dare to think of it, becoming an author. One who can write books, put into them good things which will do people good to read. The delight to sit up and write something worthwhile, production of my own soul — page after page – and finally have a book completed. Start anew and go on with the pleasant work. I pray you God give me power and strength, develop me to be useful in this world. Today it is just a year since the day I was out in Gig Harbor. How happy I was then. I hoped that he would improve, quit smoking cigarettes and start to improve his knowledge so that he would become capable of holding a good position. I encouraged him, talked to him about the danger and bad results of smoking cigarettes, but in vain. Time went on, he became sick and in debt. Still I did not want to leave him for that. But instead of planning and working toward getting out of debt and increasing his wages, he is satisfied and does not care. One day he asked me if we could not get married after a while although he was partly in debt. The terror of poverty, of having to live in a poor district, wear shabby clothes, to see him come home disgusted with life and work, stared me in the face. We parted as usual that night. I saw him up to the corner and he kissed me goodnight. But the next morning I decided to write him a letter and I did write. In the letter I told him I did not love him anymore. That I never would be happy with him and that we better part. 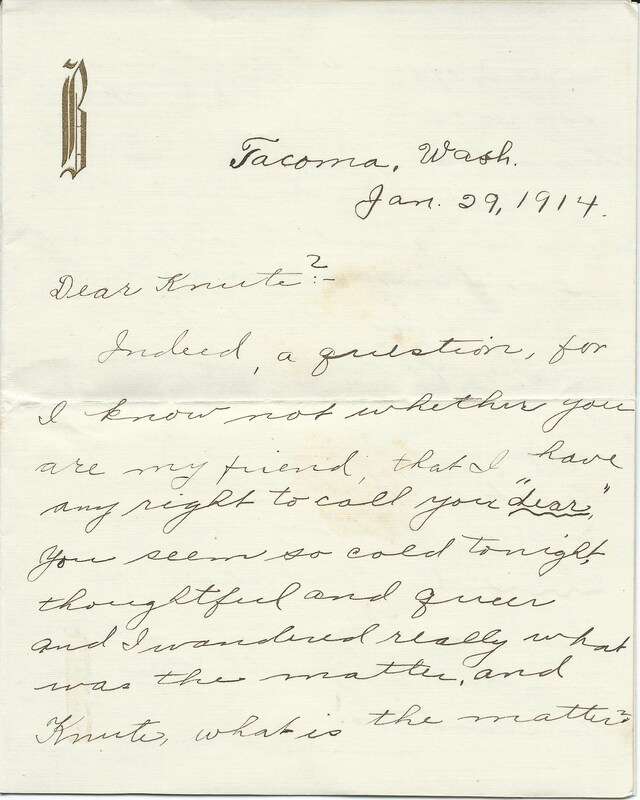 I did not want to mail the letter that day not before Saturday because Sunday I had intended to visit Clara Johnson, a friend of mine who is camping out at Fox Island. Friday night he called me up over the telephone and I asked him for his address. At first he joked about it. I am afraid he was suspicious of something wrong, but when I said that I probably would send him a card, he gave it to me right away. And then what did I do? I sat down and wrote him another letter more tender hearted than the other one but containing the same decision. The next day I mailed it. I felt I was doing my duty but it hurt me and oh my God, it hurts me yet. My eyes are red from crying. But my mind is firm. He received the letter today and if he calls me up over the telephone or calls at the house I am going to tell him that it is all off and that we better try to forget one another. Yesterday morning I got ready to go to Fox Island but unfortunately I got too late for the automobile which should take me out to the Narrows and therefore could not go. Sore at heart, I stopped in to see Johanna and gradually told her all. She thought I had done right. Last night we went up to Norstad on McKinley Hill and we spent a very enjoyable afternoon and evening there. A sting went through my heart as they asked: “Where have you got your boy?” He wanted to take me out on a boat ride around the Sound yesterday but of course having made up my mind to do as I did, I could not. Today when he comes home for his dinner he will get the letter and today when he knows that it is the anniversary of our engagement. One day he said that we should celebrate it–poor boy I feel so sorry for him. I wonder if I am doing right.—Still I feel a solid conviction that I am. Maybe if I could look into the future I would see that it was all for the best. But I feel so sad, such a love and devotion that has been between us and now—why do we both have to suffer: God in Heaven help us both. I have never felt so sad in my life. At 3:30p.m. It seems as if I am mourning someone dead. Yet I thought of one thing. If he calls up and wants to talk with me I will let him come down and I will tell him the whole truth. We can stay apart for a certain length of time, both of us to have freedom to do as we please. In that time he could try to develop his character and will power. If his love is strong enough he would reform to every thing he could, work earnestly to improve his position, yes, even stop smoking those awful cigarettes. Then by working and constantly aiming higher he would be able to save money, pay off his debt and put some aside to start housekeeping on. I would also work, do everything in my power to help him along. But I guess this is useless philosophy. I suppose he will never amount to more than what he is anyway. May be some day I will overcome this dreadful feeling. What a beautiful automobile ride I have had tonight. Peter took Johanna and me out to Steilacoom Lake where we talked a friend of Johanna, a girl who works where she used to work. As the work is hard and the people unreasonable, we encouraged her to quit. She is a sweet and sensible girl, something delicate and refined with her. She used good language and her line of thought was pure and cheerful. She said: “I am going to start all over again, I am going to go to high school and get an education.” Poor girl has had to work since she was fifteen years old. The ride was grand. When we started it was just beginning to grow dark. The coolness of the evening air was refreshing after the hot summer day. We went through the lighted streets with a few passersby and automobiles came buzzing by. As we came further from town the lights became fewer and we say only the tall fir trees on both sides of the road and through the tops of the trees a little crescent moon was peeping, pale and faint on the blue evening sky. Faster and faster the auto went and we soon came to the famous racetrack. The scenes of the day of the races came back to my mind. Sitting on the top row of the grand stand I had an excellent view not only of the whole race course but I could turn my eyes to the other side and look on the solid mass of automobiles standing on the level stretch of ground. The drivers of different kinds of vehicles were busy getting people out and in of their cars and wagons and there was a confusion of voices all speaking at the same time and trying to get people to take their accommodation to the city. Then on the other side were the racers, car after car was going by at a speed that only a few can endure. Something went wrong and they came to the pit either with a flat tire or to get a new supply of gasoline. Some stopped only a minute, others more. Still others became injured in the hazardous speedy race and had to be tugged away incapable of taking further part. Well now, I must go to bed. What shall I do? My heart is heavy like lead and my breath is deep. I have been feeling very queer in these last days I simply cannot get Strand out of my mind. I have not talked to him since Thursday before just now when he called me up. We did not say much. He asked what was the matter and I said I did not know. After a while he asked if he could not come down to see me tonight after he had not seen me for a week. I said I did not know what to say but finally I consented that he could come. “Well, darling, don’t feel so sad, I think I know what’s the matter and we can get things fixed up for the satisfaction of both of us.” “Well, I don’t think so,” I said and we said goodbye. And now he is coming up and my God what shall I do? I feel as if I ought to let him go since I sent the letter and besides Andrew, Peter and Johanna know all about it and they thought I did right when I had that feeling about him. One night I cried and still my mind was firm, but yet the old love comes to my heart and I can’t push it away. I dread to see him tonight. I hate to think of awful sad scenes and I fear that I will do the wrong thing after all my thinking and planning. God direct my ways that I do what is right!